Do you love your dog like I do? My little Flynn is basically the son I don’t have, lol! And I think I am the mother he doesn’t have, too! I love that little dude! BUT, he also drives me NUTS! He has a few habits that I can’t stand, and one of those are he pulls on the leash. We rescued him when he was probably 4-5 years old (they told us he was 2, but since he turned white on his muzzle the next year, I think that age was unlikely.) Since he was older, he took longer for us to train. Pulling on the leash has been one of the more difficult habits to break. 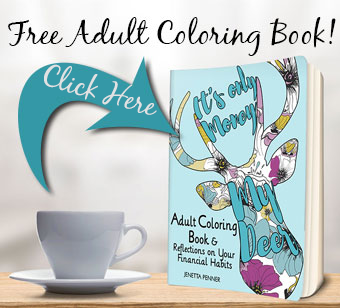 But I have a few tips that have helped us and might help you, too, without having to spend a fortune on a professional dog trainer. 1. Feed Them a Yummy Treat like “Real food-inspired” Nudges Grillers or Sizzlers– This is my #1 tip that has helped up the most. 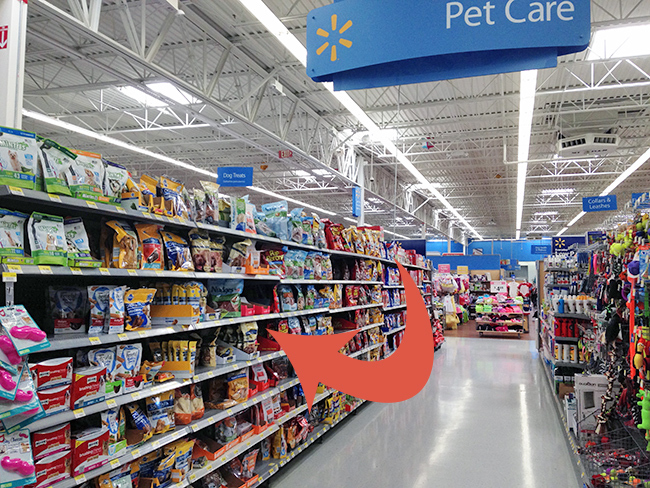 While you walk bring along small cut up pieces of treats (head to your local Walmart for Nudges Grillers and Sizzlers then find Nudges Dog Treats on Facebook ) to feed your dog as he does a good job for you. You can reward him for obeying commands. On top of this, just having the treats in your hand may keep her closer to you and not pulling. 2. Keep your lessons short and sweet. Training a dog can be frustrating, for both your and your pooch. Keep your walks short so it’s still fun for both of you. 4. Let Her Do Some Sniffing- Dogs are simply excited for new smells and environments (it’s kind of like someone holding us back from the sales racks!). Reward him with occasional stopping and smelling. Then returning to a more structured walk. 5. 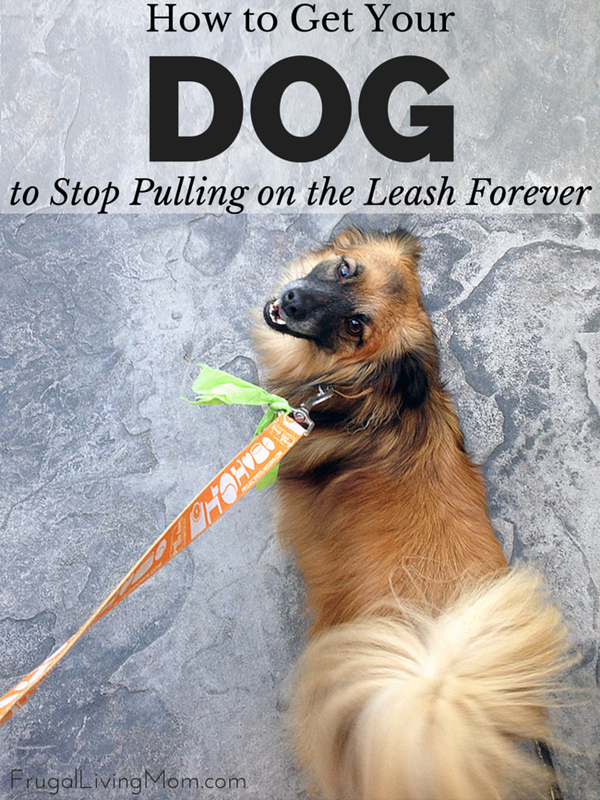 If Your Dog Pulls, Stop– If Fido starts to pull, stand still. Wait for him to loosen up, give him a treat and then resume walking. This takes patience, but eventually she will learn that not pulling might bring treats. And later you can easy up on the constant reward and just offer a treat like Nudges Grillers or Sizzlers at the end for a job well done! Walking your dog helps build a powerful relationship between you and your dog. 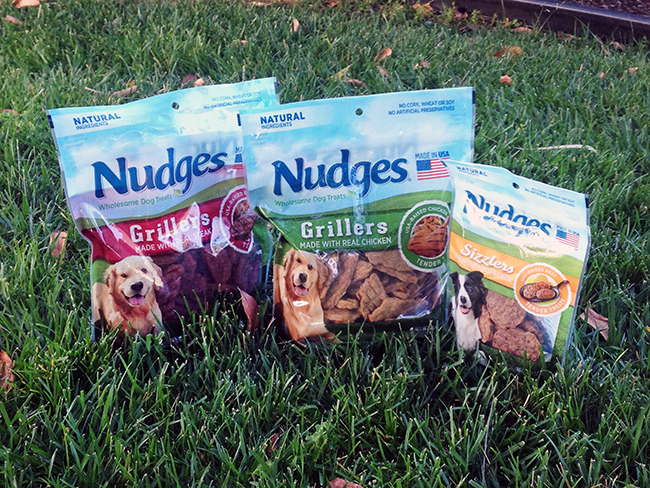 And treating her with cooking inspired Nudges® Wholesome Dog Treats makes that even better for Fido! Also look for new Jerky Cuts value size (36oz) at Walmart. 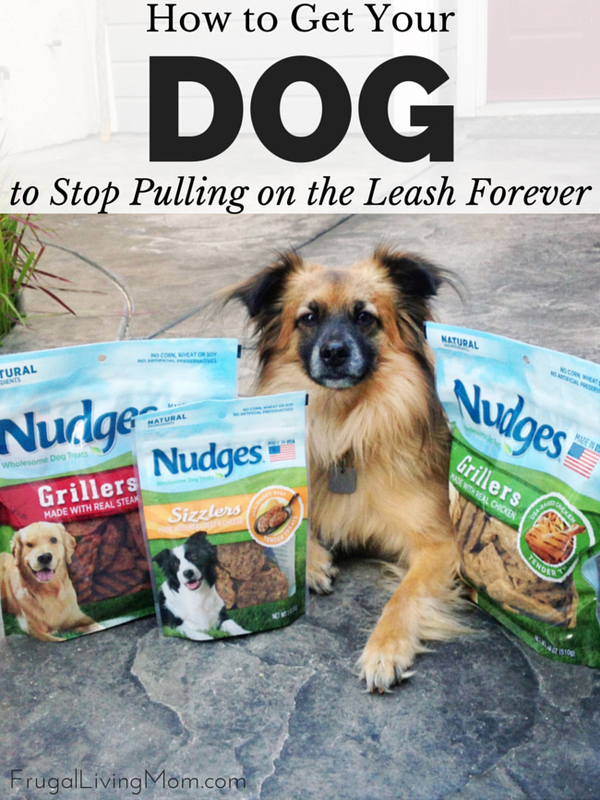 Does your pooch pull on the leash? Have you tried training him to stop? What are your best tips? this is a good method to stop the pulling, and yes it does work. However it ignores the underlying problem, your dog simply disrespects you. Their natural instinct is to follow their leader not lead the leader, so they walk behind or next to the leader. if a dog is pulling, he's saying I'm the boss lets do this instead and sniff this ect. Mel, Actually Hailey is accurate. Hailey didn't say that you have to beat your dog into submission so why would you jump to conclusions about the dog being scared of you? If a dog thinks it's higher in the pack than you, it will go through doorways first, lead the walk, etc. Gaining respect and making sure the dog knows your the alfa in the pack is mandatory. This is why they say to "Stop" when the dog pulls. It's reminding the dog who is really the alfa. Actually, the idea of dogs being a pack animal needing an "alpha" in charge has LONG been disproven. The original study that suggested this was ever true was done on captive wolves, not on dogs. (Surprise, while dogs are descendants of wolves, they are NOT wolves. Just like we don't live in trees and throw feces, we are descendants of apes, but NOT apes) Dogs learn best through positive reinforcement. Stop watching the dog whisperer and reading outdated "information" from the 70s. Exactly, Audrey. It's so scary to see how many people still think everything a dog does is motivated a desire to be alpha. It's the 21st century, people! Right...the dog that pulls just "disrespects" it's human because walking on a leash is such a "natural" behavior. I mean, you see alpha wolves walking their pack on a leash all the time... Come on people, get real. Geesh. Actually, the need to be in front is not a source of dominance at all. It is simply because dogs have four legs and humans only have two so they will naturally walk faster than us. Want a really good workout, keep up the pace with your dog. Now if the pulling is very bad like literally dragging you, then yes there is an unbalance of respect there. I have worked with my dog and she doesn't pull nearly as much as she used to. I am fine if she wants to walk a bit ahead of me as long as it isn't pulling. Then we stop and wait a bit. This is totally unrelated to your post, but u have a dog that looks EXACTLY like yours! I rescued him from a shelter in Oxford, MS, almost 13 years ago. I've never known what he is a mix of, but he's the best dog! I saw your post on pinterest and freaked out! awwh... a pair of cuties! Hi, thanks for your tips! What kind of dog is your Flynn? He looks a lot like my family's dog and we could never figure out what she is exactly. Thanks! We don't know... but have thought maybe Pomeranian and Sheltie? My Josh looks so much like your baby, except he doesn't have any black around his face. He is also a rescue dog that we have had for about a year that is about 5-6yrs old. We were told he was Pom and Spaniel. We have had several very strong dogs that loved to pull. Until one vet recommended a Gentle Leader Dog Collar. The nose loop redirects his head towards you when he pulls forward, preventing pulling. It was amazing to walk after we tried the collar. No more pulling !!!! Could I make a suggestion? Great post by the way! It's how I taught my dog, but instead of rewarding him with food, the reward was continuing the walk, which is what they really want. The food rewards are very effective, but maybe use a food reward when he takes a couple steps by your side (then gradually step up the distance between treats) If you treat your dog after he pulls and comes back, you may accidentally reinforce the pulling, instead of the staying by your side. Hope that makes sense? Great post though! Rewards do NOT have to be food or munchie treats. Rewards can be pets, skritches, stroking, soft words of praise, etc. Treats are full of fat, which is what makes them so tasty. You do not want to end up with fat animals and animals, like people, respond well to hugs and kisses and loving words. Depends on the dog. My puppy only wants affection when he's tired. If I pet him as a reward he looks at me with disgust. Praises help him to know he's done the right thing, but they don't reinforce the behavior as much as I need them to. hey, I see a lot of training things, where treats are the number 1 reward but what do you do when your dog is overly concerned with treats and still does not do what you say? I have a dog that whenever I grab the treats, whether she sees them or not, she does all the commands she thinks I want her to do just to get the treat. but when no treats are around (out of sight and nose range) she goes back to being disobedient. how would you fix that problem?